What do students say about technologies? The University of Leicester has been piloting two lecture capture systems (Echo360 and Panopto) since autumn 2013. I have been working on evaluating the systems and the use of lecture capture at our university generally. I thought the wider community might be interested in our preliminary findings on student views particularly, and some reflections. 1. Did you listen to/view at least one of the recorded lectures? Asked why they didn’t view any, students gave answers such as “Didn’t feel it was required because I made notes during all my lectures.” One student said they make their own audio recording so don’t need a recording made by the university, thereby underlining their perceived need for some kind of recording. 2. How many times did you listen to/view the lecture? 3. Did you attend the lecture? 4. If you did not attend, did the fact that you could watch the recording later influence your decision not to attend? 3 students admitted yes it did influence their decision not to attend. It is still very early days in our university’s foray into lecture capture. 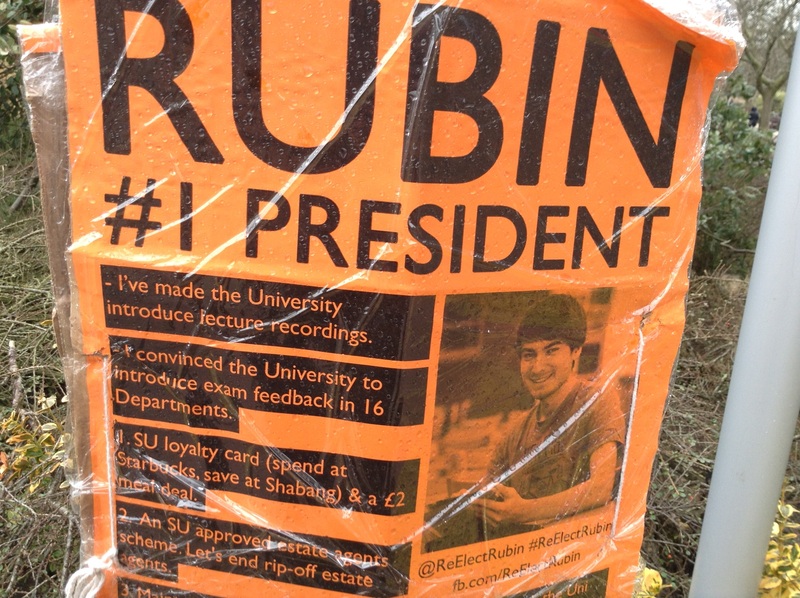 Will students not attend lectures because they know they are being recorded? The 3 students answering yes on this question represent 4% of students who did the survey. Another interesting note is that one of the participating lecturers commented in an interview (I paraphrase), “I have so many students in my lecture that I actually don’t mind if they don’t attend and just watch the recording.” I would say this lecturer’s view is far from typical, and yet this is not the only time I have heard this point of view. 5. For what reason(s) did you listen to/view the recorded lecture? More than one answer could be chosen. 90% answered somewhat or very important. When asked how long after the lecture should the recording be made available, the vast majority answered: within 24 hours. 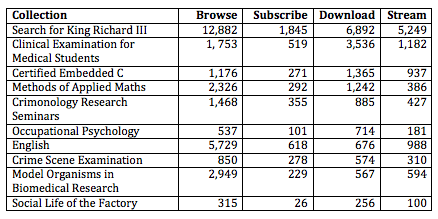 What open learning materials are being downloaded in China? Earlier in 2013, I completed a project for the Higher Education Academy, called iTunes U Reach. In this project, I facilitated the launch of the University of Leicester’s iTunes U channel, of which the vast majority of items are licensed CC-BY-NC. Then I could observe how and what materials were consequently consumed by people around the world. Our university is particularly interested in what China is looking at, because iTunes U is visible in China, while YouTube and Vimeo are not. (I’m not sure about SoundCloud — anybody know? Leave a comment if you do!) Well, we launched our channel around Easter 2013, and the top ten collections and their consumption methods and numbers are below. It’s helpful to remember that not all of these collections were launched at the beginning; launching all of these collections has been a gradual process. For example, Model Organisms in Biomedical Research, number 9 on this list, was only launched on 15 October. So the numbers shown for that collection were achieved in less than one month. Who has been looking at these materials? 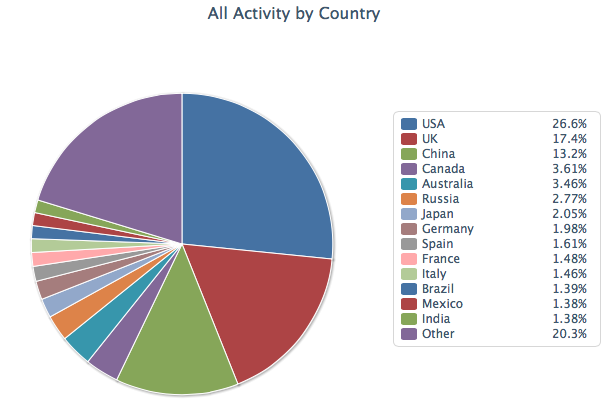 Below are the statistics of activity by country. China is the third most active consumer of UoL material. It is interesting to note that in recent weeks, I have noticed Turkey appearing in these numbers too. Turkey is another country which does not have access to YouTube, but does have access to iTunes U. So the top 3 subjects of interest were, in order: English, Medicine, Psychology. Items of all three formats were chosen for download. I had an expectation that perhaps the Engineering topic would be most popular, and that there might be a clear preference for video, and so these results were surprising to me. I should make it clear that the English materials are not for the teaching of English language. They are lectures on creative writing and on linguistic examination of social media communications. 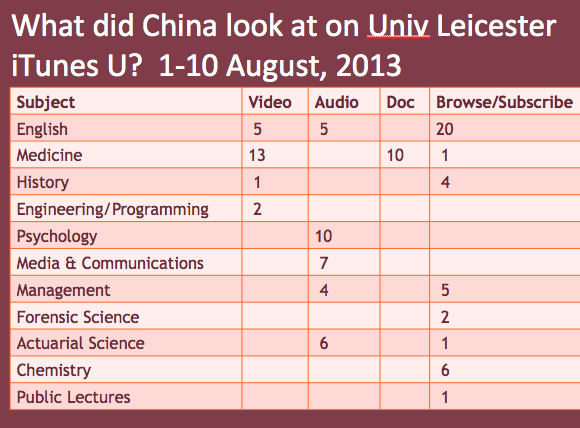 Of all of our UoL materials, these are the most downloaded by Chinese people. One or two more interesting observations: On 22nd October and lasting for 2 weeks, Apple featured our collection “Model Organisms in Biomedical Research” in its New & Noteworthy section on its iTunes U home site. During that time, China became the number 2 country, immediately after USA, in countries looking at our materials. This suggests that China is particularly responsive to materials promoted by Apple. I also noticed during that time, that the percentage of users consuming our materials using iTunes on a Windows computer increased dramatically, to number two just after iPad users. This suggests that Windows iTunes users are also particularly responsive to Apple promotion. It’s possible also that China’s iTunes U visitors are more likely to be using Windows computers — I would have to look more carefully at the data to say this definitely, but it seems reasonable. A final comment I would make is that I found, from interviews of Chinese students and educators, that Chinese universities began in earnest to produce their own openly licensed learning materials, or at least learning materials being treated as though they are openly licensed. I found, for example, that the Chinese internet company NetEase has been releasing openly-licensed English language learning materials in its own app, after having added Chinese subtitles. NetEase has now begun to partner with MOOC-provider Coursera. I have not yet heard of any Chinese MOOCs, but perhaps they are right around the corner. Theatre for a Change (TFAC) is a London-based charity engaged in training teachers to give instruction to middle- and high-school age students about reproductive health issues. TFAC is active in African countries including Malawi and Ghana. Their courses have taken various forms including theatre workshops, art, and radio programmes. After reading about our work to help deploy our Criminology’s MSc in Security, Conflict and International Development with its iPad and app model, TFAC contacted us to help them extend their reach to students in more remote areas by transforming to a mobile learning model. 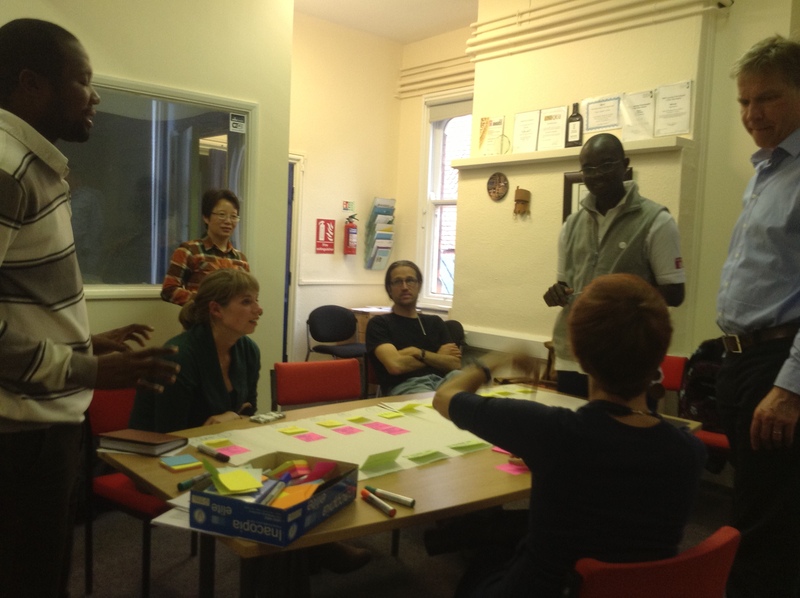 We held a 7Cs of Learning Design workshop with TFAC in May 2013, and helped them to storyboard a new ‘mobile’ version of the course. I recall at the time the above photo was taken, the group was discussing how to ‘chunk’ each learning unit in a way suitable for mobile phones, how to refer students to audio-recorded material, and how to include feedback and discussion through mobile methods. Since that workshop, I have helped with transforming the material into mobile-ready formats, and working on using social media as a simple virtual learning environment / learning management system. This project is a great opportunity to create a different kind of mobile learning model, and we are very much figuring it out as we go along. It was great also to think about designing for mobile learning, from the beginning. Designing the learning for mobile, from the beginning, has got to be the key to mobile learning success. I plan to update this blog as the project rolls out, so stay tuned! The Institute of Learning Innovation will be well-represented at ALT-C 2013 conference: Building new cultures for learning. with open learning materials.’ This paper will share findings from the HEA-funded iTunesUReach project in which the use of open educational resources (OER) by overseas students was researched. This project was represented at OER13 with the poster below. learning design, digital literacy, transformation.’ This paper will share findings from the JISC-funded Places project which is evaluating the use of iPads in two University of Leicester distance learning Masters courses. I recently posted about my pilot study, but I have now received Research Ethics approval to move into the main study. The first phase is observations, and I will start within a number of LinkedIn discussion groups or forums. There are different ways to approach research in such groups. I chose to be open and transparent about what I am doing, requesting support from the forum owner, manager, or administrator, and posting a message for all group members. I await responses from some of the forum leaders, but the largest group/forum, with over 45,000 members, was one of the first to concur. The message pasted below is what I have posted, adding to one to clearly state that the study was not one endorsed by them. In other words, as with all of the groups associated with organisations, they were not involved in the design or approval of the research. I look welcome any comments or questions about this approach. This message has been approved by the group owner. I am conducting a PhD in eLearning and Learning Technologies through the Institute of Learning Innovation at the University of Leicester (http://www2.le.ac.uk/departments/beyond-distance-research-alliance). In the fall of 2012, I conducted a pilot study of the use of online personal learning environments and digital literacy skills by security management and investigation professionals for work-based learning and continuing professional development. (https://beyonddistance.wordpress.com/2013/03/11/update-on-my-research-pilot-study-completed/). By posting a message in different discussion groups, I received a global response from practitioners in 17 different countries who completed the online questionnaire. A number subsequently spoke with me in an individual interview. The results of the study allowed me to continue to my main study. For my main study, I want to give full and transparent disclosure of my research intentions. While I anticipate this will not cause any discomfort, I welcome your feedback or questions. This study will focus on the actual collaborative learning activities and the digital literacy skills demonstrated. I will visit forums in which I am a member, or I will join with acceptance of the administrator/manager. My primary research activity in the forums will be to observe the learning activities taking place within the online space. This may lead me to other online resources, and I will identify members that I may wish to contact for individual interviews or to participate in a focus group. Others may also refer me to potential study participants, or you may self-identify to me. No forum comments will be used without the consent of the one making the comments, and anonymity and confidentiality will be maintained. An Information Sheet and Informed Consent will be provided to anyone who considers participation in an individual interview or focus group, or upon request. Interviews are anticipated to take between 30 and 60 minutes. My research approach does not preclude me from participating in discussions, as may be appropriate. I am a member of security and investigation related forums due to my affiliations with the field. For a number of years, I have been a member of ASIS International and the Association of Certified Fraud Examiners. More detail is available in my LinkedIn profile (http://linkedin.com/in/tonyratcliffe). 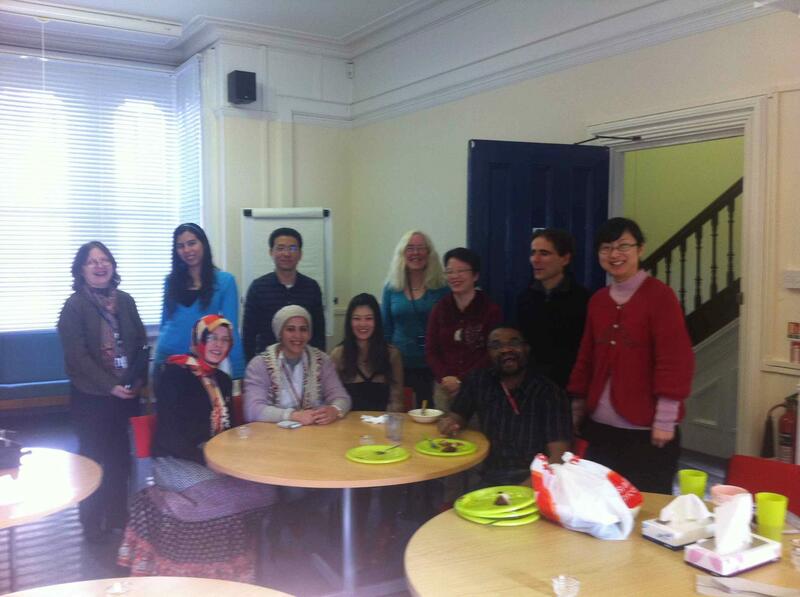 This study has received Research Ethics approval from the University of Leicester and will continue throughout 2013. A.E. (Tony) Ratcliffe, M.Ed., CFE, P.Mgr. Now in the third year, part-time, toward my PhD at the University of Leicester, I am about to embark on my main study. This is likely a good time to give a brief report on the pilot study that I conducted in the latter part of 2012. The purpose was to study how security management and investigation professionals use online learning environments for their work-based learning and continuing professional development. I was also interested in the digital literacy skills that may be possessed or required by these professionals. There were two phases in the study: a questionnaire followed by personal interviews. I initially posted a request for study participants in 14 discussion groups. Sixty-seven people in 17 different countries completed the questionnaire, and 35 indicated they would participate in an interview. I conducted 10 interviews by Skype or telephone, as well as 1 by email. These interviews involved participants in Canada, the USA, the UK, Lithuania, and South Africa. The response was encouraging, and it permitted me to gain a view of the field and what might be expected in the main study. My early findings have been that, beyond face-to-face, using the telephone and email were the most common ways to connect with contacts for learning-related questions, although online discussion groups or forums are a popular way to collaborate for problem-solving and learning. However, many more participants tend to read (consume) the resources than actively engage in discussions on a regular basis. The reasons for not being more involved included concerns with sharing publicly and the need to determine the credibility of information posted. I am preparing a paper about the pilot study that I hope to present in July in Berlin. This report will provide more analysis of the findings. The main study will include observations of online learning activities along with interviews. I hope to complete the thesis by December 2014. The Institute for Learning Innovation (formerly Beyond Distance Research Alliance) recently welcomed several new PhD students and visiting scholars. Our students hail from Saudi Arabia, China, South Africa, Turkey, Canada, Mexico, Denmark, Greece, Rwanda — plus a few from the UK. 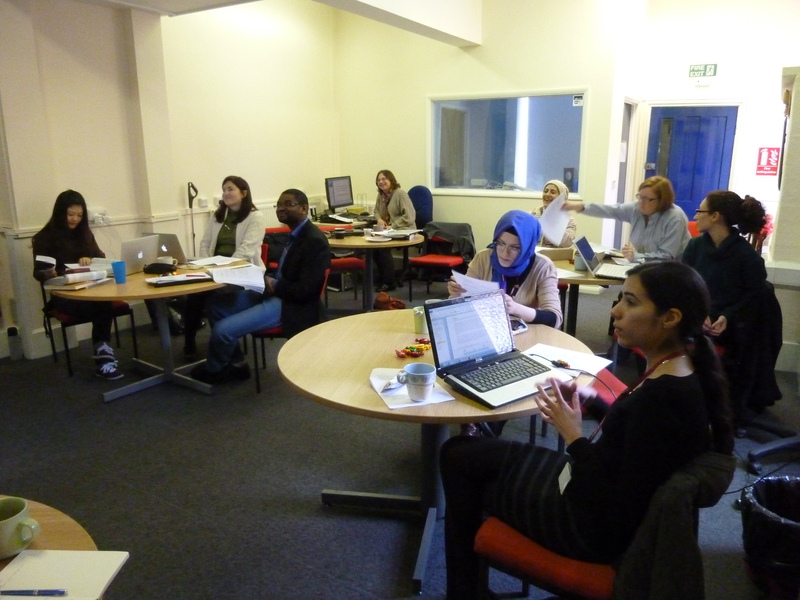 On 18 and 19 February 2013 we held PhD Training Days, in which we gathered in the Studio (formerly the Zoo) to share research progress and participate in workshops led by Professor Grainne Conole, Dr Tracy Simmons, Dr Paul Reilly, Dr Chris Comber, and Dr David Hawkridge. Not all of our students could join us in person, however. We held the sessions live online using Adobe Connect. Our Canadian colleague Tony Ratcliffe, for example, joined us online from Canada, and unfortunately for him had to wake up at 3.30am in order to do so. In spite of this, he presented his work beautifully. To celebrate Open Education Week (begins 11 March 2013), Beyond Distance colleagues will be doing an online webinar to which you are cordially invited! We hope to have discussion, debate, and controversy! So please save the date and time —- more information and a link to connect will be blogged closer to the time. The webinar will be in format of a roundtable discussion. Informed by our work on various open educational projects of international scope (POERUP, SPEED, TOUCANS, SPIDER, and iTunesUReach, among others) our team will share their perspectives and invite discussion on intercontinental policies for OER uptake, developments in the use of open resources and open practice in learning design, and issues around open practice in mobile learning, with a special focus on the view from the developing world. Hope to virtually see you there!